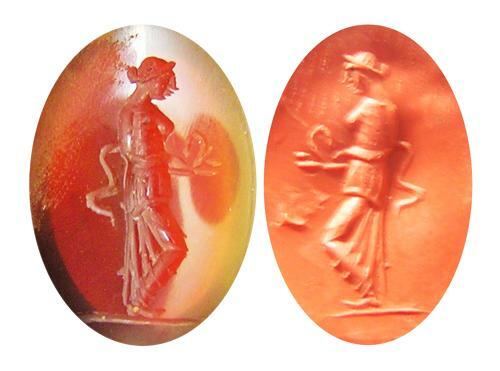 This is a Classical Revival glass intaglio, dating to the 18th - 19th century. It is cut with a standing figure of Salus, feeding serpent. The style is well done, imitation of an original Greek version from the 3rd - 4th century B.C. Such an intaglio would have been hung on a fob seal, by a gentleman possibly purchased on a Grand Tour. PROVENANCE: Ex. European Collection, France.